In the past, Hebrew geographical maps were relatively rare, but they all showed the Land of Israel as a separate entity, stressing the sanctity and uniqueness of the country to Judaism. Abraham Bar-Jacob, a convert to Judaism, drew a map of the Holy Land following that of Christian Adrichom (1588), incorporating many Jewish elements such as the route of the Exodus from Egypt to Canaan and the designation of the territories of the twelve tribes of Israel. 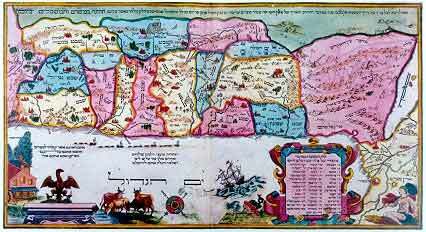 The map was reproduced in a Passover Haggadah as one of the earliest Hebrew printed maps.